Tonight I was lucky enough to knit with a fun group of ladies. They meet at a Starbucks that is not at all close to where I live but it was well worth the drive. I found them on Ravelry. There were knitters, a spinner and a crocheter. Projects included an afghan, socks, sweaters and more. Some of the ladies were teaching each other about the KnitCompanion software on their iPads. 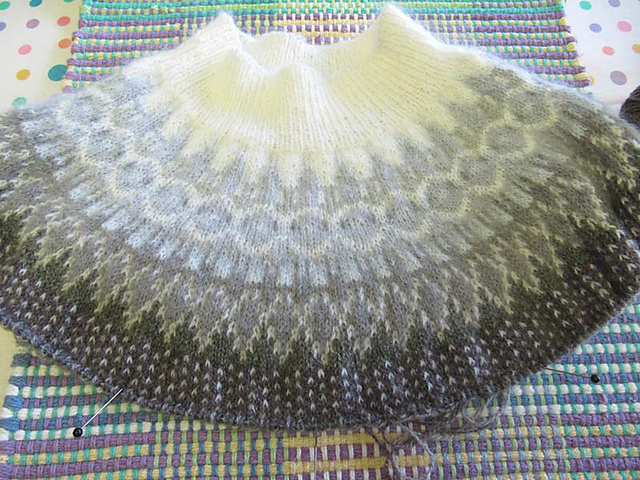 For my project I took a pullover out of my stash, one that I started on June 27, 2010 - the Bohus Large Lace Collar. To my friends in Denver who were also knitting a Bohus - I've restarted mine. I hope that you'll finish yours too. I'll be checking my email for updates! This group met every month and it was so enjoyable that I looked forward to each and every gathering. My sweater is a little beyond what you see here. I've started working on the back. From now on I'll be knitting only with black. I love all of the Bohus designs and I plan to make others, but first, I will finish this one. I'm knitting from the stash. Cool! !